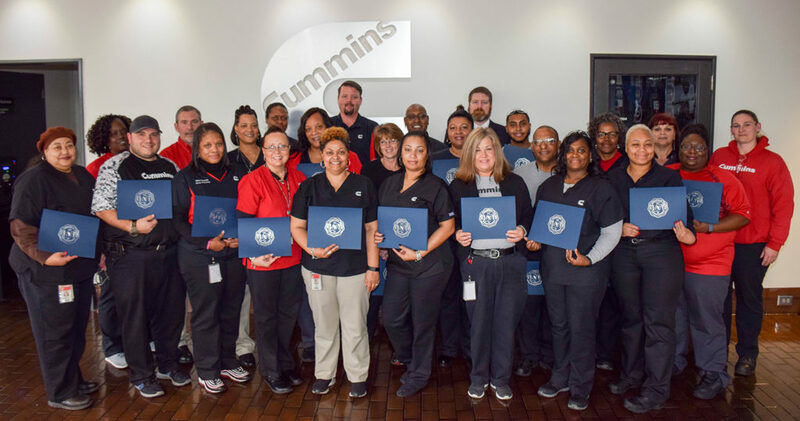 Nash Community College recognized 27 employees from Cummins Rocky Mount Engine Plant this week for completion of Business Leadership and Practical Supply Chain Management certificates. The College worked with the company to provide specialized online instruction tailored to meet industry needs. As a result, two cohorts were formed and employees earned the two certificates, each consisting of 15-16 college credit hours that can be applied to further educational opportunities. The coursework for Supply Chain Management informs students about international and domestic movement of goods from the raw materials source through production and ultimately to the consumer. Courses include transportation, warehousing, inventory control, material handling, purchasing, computerization and supply chain operations. Employees who participated in the Business Leadership Certificate were introduced to various aspects of the free enterprise system and were provided with a fundamental knowledge of business functions, processes, and an understanding of business in a global economy. In response to industry needs, Cummins employees are also currently working to earn a certificate in Data Management and Analysis through the Computer Information Technology department at Nash Community College. Congratulations to the following Cummins employees who completed Nash Community College certificate programs.